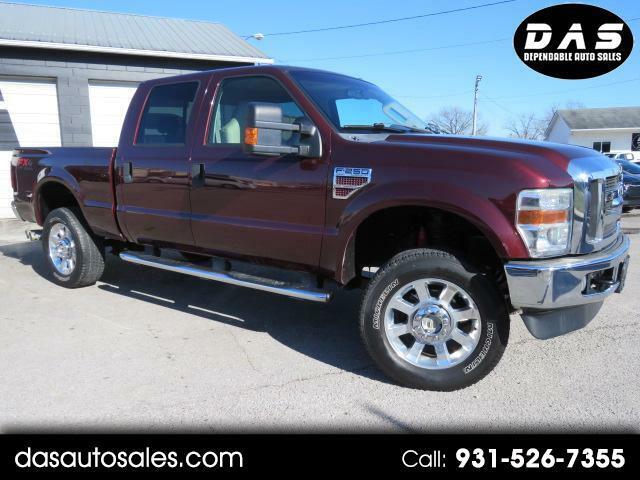 Our 2009 Ford F-250 Super Duty SRW Lariat Crew Cab 4X4 is the perfect choice for a hard-core machine that's civilized enough for everyday use. Powered by a TurboCharged 6.4 Liter PowerStroke Diesel V8 that offers 350hp while connected to a durable 5 Speed Automatic transmission. This Four Wheel Drive powerhouse is your perfect companion for your pulling, towing, and off-road needs with Front Tow Hooks and Towing Package. The exterior boasts tube steps, privacy glass, and great looking alloy wheels. Inside our Lariat, you will be impressed with heated leather front seats, cruise and audio controls on the leather-wrapped steering wheel, rich wood grain accents, and a great audio system w/DVD Player. Safety features on board this Ford F-250 make it as safe as it is sensible for hauling the whole family! A tire-pressure monitoring system, SOS post-crash alert system, and a fleet of airbags act as your personal bodyguard. Print this page and call us Now... We Know You Will Enjoy Your Test Drive Towards Ownership!